Just in time for the holiday weekend!! 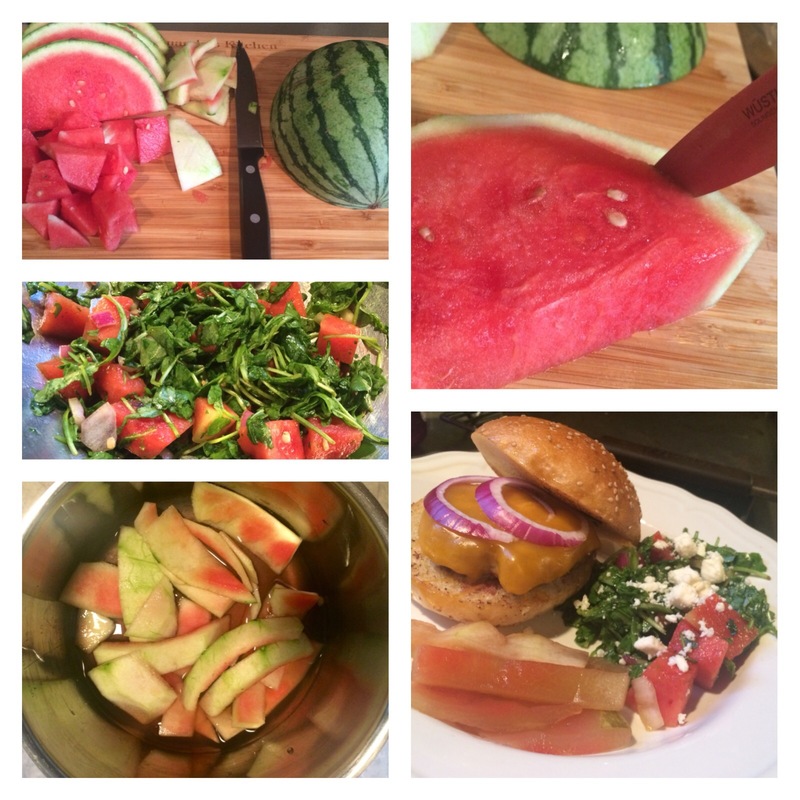 Let’s bust out the watermelons and swing into summer at last 🙂 The flesh of the watermelon provides a sweet topper for spicy arugula salad, and the pickled rinds make an unexpected side to grilled burgers, dogs, potato salad and a cold bottle of beer. Just like actual pickles, only cuter and niftier! I suggest trying those miniature melons you see at the supermarket starting this time of year. Buy a couple pounds at least; this recipe doubles easily from there. Halve the watermelons then slice into wedges. Cut off and set aside the pulp (the pink part) for use however you choose — particularly large-diced on a salad — leaving just the rind. Using a knife, cut off the dark green outer layer and then slice the remaining rind into two-inch pieces. In a small pot, combine the rinds, vinegar, sugar, a pinch of salt and 1/2 cup of water. Heat on the stove on high until boiling; once it boils, reduce heat to medium and cook, stirring, for 7-10 minutes or until the rinds are translucent and softened (test with a fork). Remove from the heat and set aside to cool. When they are at room temp, serve them without the extra liquid. This past weekend, we went to a potluck with a loose Mexican food theme. Our friend Terri (hi, Terri!) made the most delicious and simple enchiladas, and our friend Seth brought an amazing guacamole with chopped mangoes (!) in it. We also had margaritas, chili, rice, and corn bread. I could eat a meal like that every day of the week!! I’d volunteered to do dessert, but as the day drew closer I realized I didn’t have enough rhubarb handy to make the crumble I’d envisioned for the 10-12 people expected, so I had to go to plan B. I racked my brain trying to think of something festive but light that could feed a good-sized crowd, including many toddlers. Then I remembered how well this orange creamsicle cake turned out a couple years ago, and in that vein made an even EASIER dessert with crushed pineapple and angel food cake. It has just two ingredients, not including any whipped cream you might want to add, and it came out so delicious! 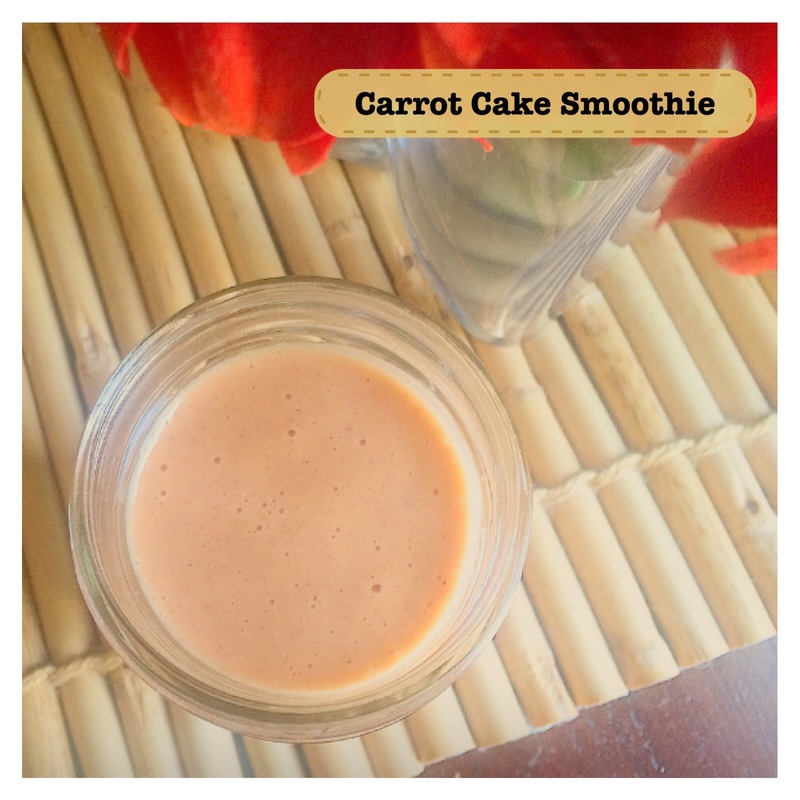 Perfect for summer and so easy, it’s definitely something I’m going to make again and again. whipped cream if you want it for topping! Preheat the oven to 350 and butter or Pam-spray a 9 x 13 baking dish (I used glass). In a mixing bowl, combine the dry cake mix with the crushed pineapple, juice included. (Don’t add water per the box instructions!) Stir until evenly combined. Pour into your baking dish and bake for 30-40 minutes (mine took closer to 30 — make sure it doesn’t burn!) It’s done for sure when a toothpick poked in the middle comes out clean. Let cool and serve! 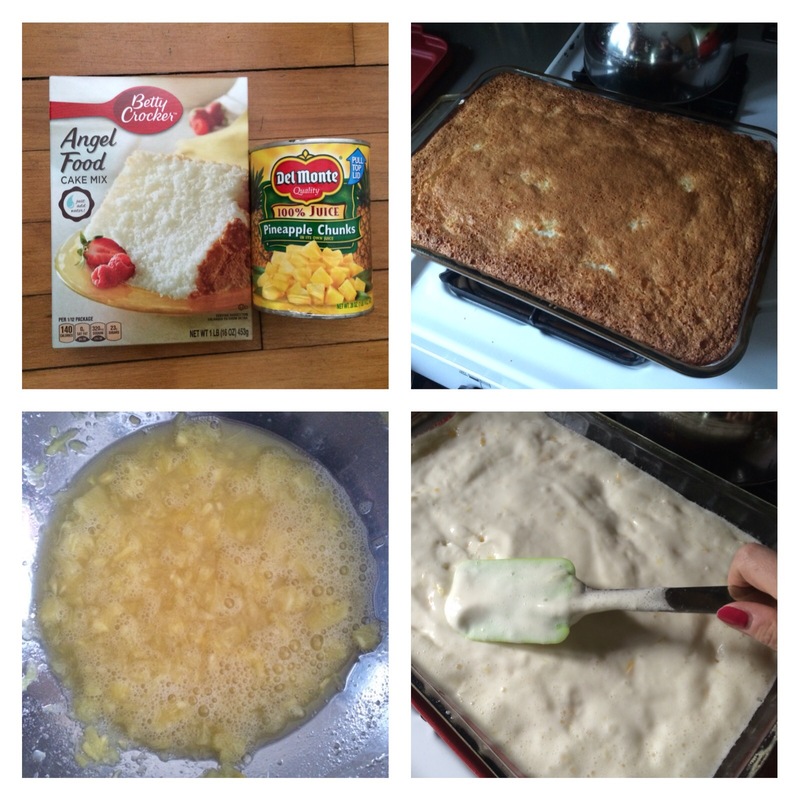 Notes: I could only find pineapple chunks, so I buzzed them through the food processor quickly to pulverize them. The consistency you see there in my photos is what you want. I didn’t serve this with ice cream, but I think it would go well together! Because I was taking this to a potluck, I just bought a can of whipped cream, though I usually prefer to just make my own (especially ever since Mark got me a stand mixer). You could also make this in a cupcake tin with liners instead of a glass baking dish. Just be sure to cross-reference the cooking time on the side of the cake mix box if you drastically alter the pan size. Can’t wait to make this tasty Broccoli Toss! What a week!! I had a crazy, crazy time at work, and I’m ready for some easy food. I was reading Parents Magazine on the train in this morning and saw this Crunchy Broccoli Toss, and I just know Georgia would love it. She loves beans, edamame and “trees!” (as she calls broccoli — which is funny because so did my little brother when he was a tot). Anyway, I can’t wait to make this and I just wanted to share it with you, too. Happy Weekend! Good Tuesday morning everyone! Hope you all had a restful Mother’s Day. We didn’t really do much — took Georgia for lunch and ice cream with both her grammies & her favorite Uncle Brent — and I’m already focused on the week ahead and the DAMN SUN COMING BACK OUT. Am I the only one losing their mind over last week’s seven-day stretch of rain? Weather that seemed charming and curious on my visit to the Pacific Northwest became alarming and anxiety-inducing when it overtook what’s supposed to be a sunny and mild season in New England. Thankfully, the nice weather seems to be back for this week (finally), and nothing says spring like a light, fresh salad. I created this one a couple weeks ago, and I can’t wait to share with you! I’m a sucker for any salad with beets in it, especially when they are set off with a flavorful cheese, and this one really hits the mark with a salty feta alongside grapes and beets. 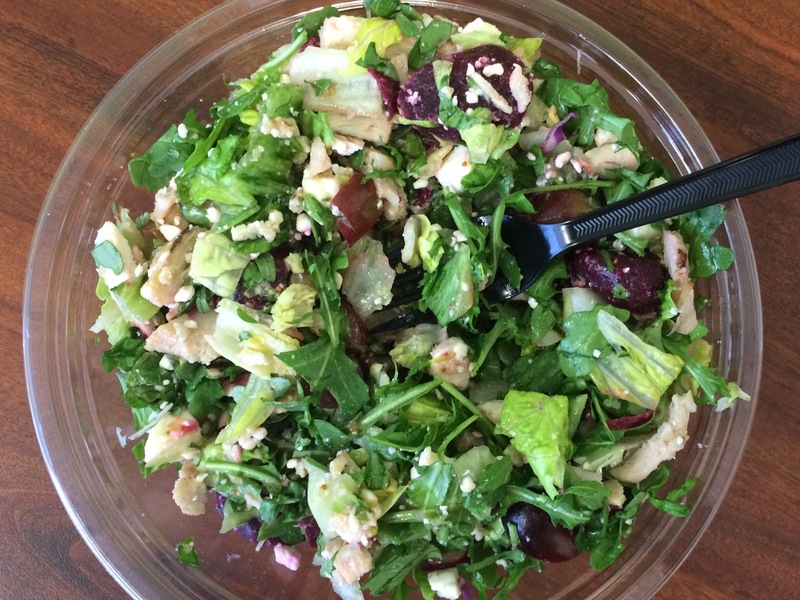 Plus, scroll to the end for an easy knockoff recipe for the Cosi Signature Salad — a weakness of mine when I buy lunch out! Greens: I used Napa Cabbage, Purple Cabbage and Arugula. Toppings: Feta, crumbled; grapes, sliced in half; baby beets, sliced. Optional Add-On: chicken for a little protein boost. Dressing: Fig vinaigrette. Stonewall Kitchen makes an amazing one! Chop and toss salad together in a large bowl and serve. That’s it! Don’t like feta? Try goat cheese, which always pairs awesomely with beets. Beets are actually not that difficult to peel and slice at home, as long as you use a plastic cutting board and wash it immediately afterward, and be careful not to touch anything with your hands covered in beet juice because it stains! 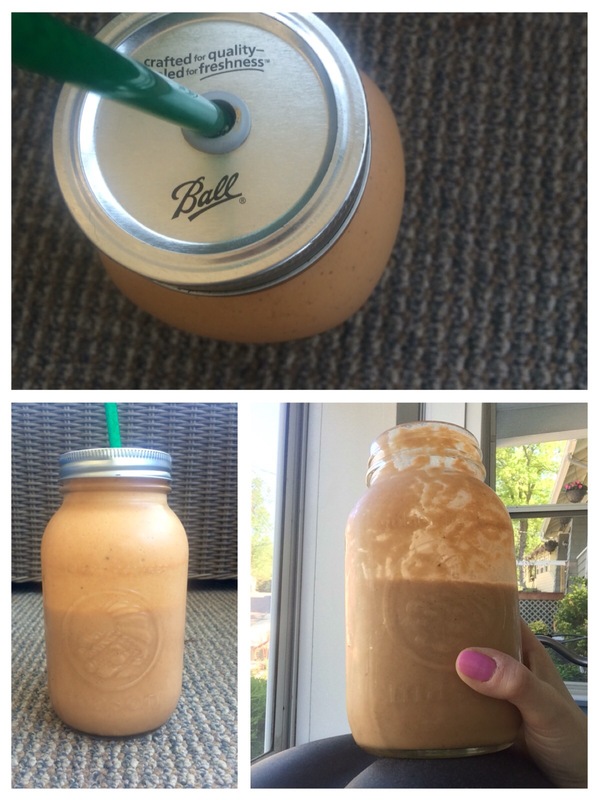 Or, you can buy the canned/jarred kind, or snag some at a salad bar if you’re making this on the go. Personally, I made this for the first time at a salad bar, and then recreated it at home later with great results. Now, it’s one of my new favorites! You can only order so much chicken Caesar for lunch before you want a change of pace. 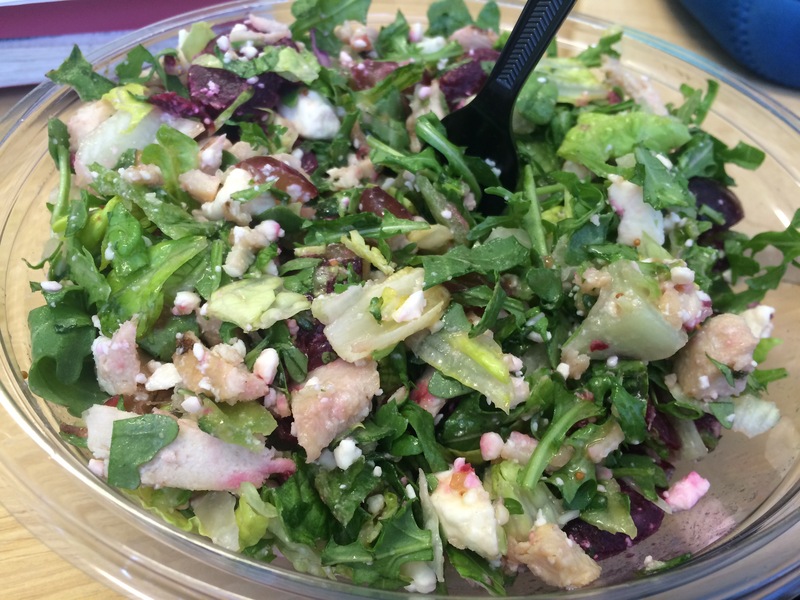 What are your favorite salads? 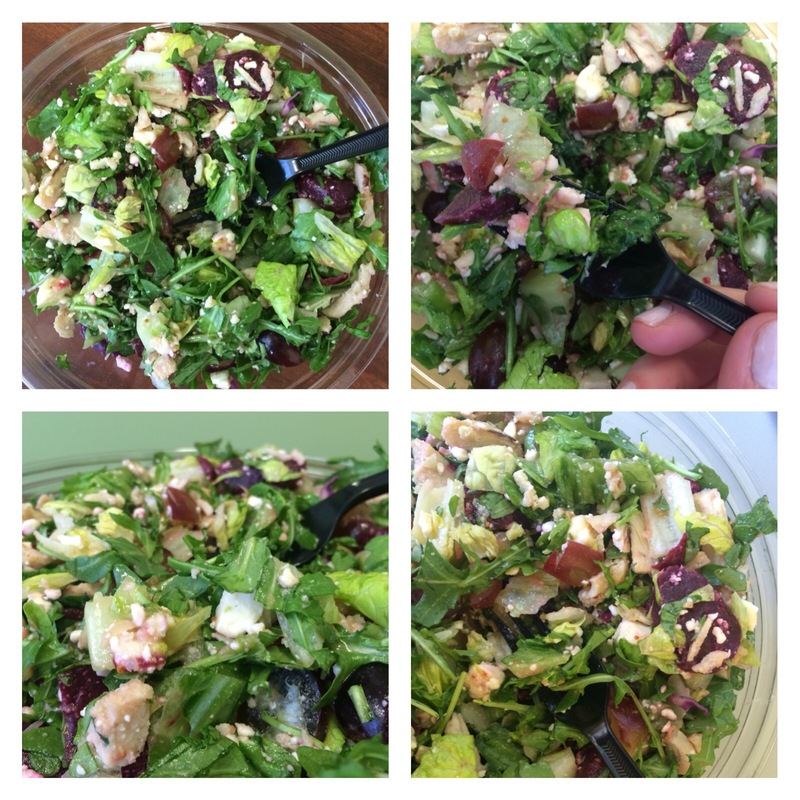 My other go-to orders for lunch and dinner are Panera’s Fuji Apple Chicken Salad, and the Cosi Signature Salad, which is easy to recreate at home with grapes, pears, pistachios (sold shelled at Trader Joe’s), dried cranberries, mixed greens, Gorgonzola and sherry shallot vinaigrette. Sherry Vinegar is a specialty item, but lots of food bloggers have spent time trying to mimic its flavor with a copycat recipe, and I think Real Mom Nutrition has it down pat: you just need to whisk minced shallot, red wine vinegar, mustard, honey, and olive oil together until thoroughly combined, then add salt and pepper to taste, to recreate Cosi’s awesome house salad. The ratio is 1/2 a shallot, peeled & minced; 2 TBSP red wine vinegar; 1 TBSP each of honey and Dijon mustard; and a 1/2 cup of olive oil, finished with salt and pepper to taste. The best part of the Panera salad is those crispy apple slices, if you ask me. I’m going to try my hand at drying apple rings into chips soon so that I can make a knock-off version of this awesome salad at home. These takeout salads run you almost $10 a pop, which is CRAY if you can easily make them at home! If I have any luck making dried apple rings, I’ll definitely post about it for you! Well, that’s all for me today. I hope everyone has a great week!